More ZEPS Electric Buses On The Way? Back in October, I first reported on the BFT Electric Bus Demonstration project. Since that time, there have been some updates. 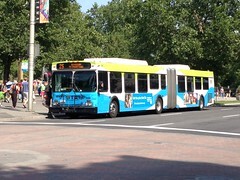 Perhaps the biggest and most important is that the ZEPS Electric Bus was finally delivered on the evening of May 13th. Am I late in reporting this? You bet. However, I was trying to hold off on writing a post about this until I had a chance to get a close up look at the ZEPS Electric Bus and take some photos. However, after last night’s BFT board meeting, I figured I needed to share the latest update to this project, because it is a big deal. Included in the TIGER Grant application are letters of support from all the participating agencies, along with letters of support from Senator Richard D. Roth (31st District CA), Michael Kluse (Director of Pacific Northwest National Labratory), Joseph K. Lyou, Ph.D. (President and CEO of Coalition for Clean Air), and Larry Rubio (CEO of Riverside Transit Agency). Between all the different agencies, the proposal is for 41 buses to be built. 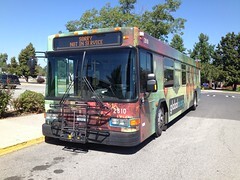 All agencies (not counting CALSTART) will be providing at least 2 buses to be rebuilt as ZEPS Electric Buses. The grant funds will pay for the installation of charging stations and subsidize operating costs, with each agency providing their own local match. As the lead agency in this project, BFT will also be adding some additional infrastructure. The most noticeable part will be the installation of a solar array above the bus yard, which will be used to power the electric charging stations (this will be the 1st in the US, 5th internationally). BFT will also be working in collaboration with Columbia Basin College (CBC) to develop the “US Zero Emission Bus Center of Excellence,” which will be a resource and training/research center for agencies across the country. While the participating agencies are only “ankle-deep” into this project at this point, I think the likelihood of this TIGER Grant being approved is highly likely. If it is approved, it will be a game changer for all the participating agencies, but especially for lead agency Ben Franklin Transit. For all we know, this may be just a small first step into the future of transit. UPDATE 9/5/13: The final list of TIGER grant awards for 2013 has been released today, and sadly this project was not on the list. Looking back on it, there are several possible reasons as to why the “US Bus – National Long Range Electric Bus Deployment Partnership” was not selected. For starters, if approved it would have been the largest TIGER grant this year, at over $39 million. (There have only been 12 grants over that amount in the history of the TIGER program, 11 in 2009 and 1 in 2010.) Also, the multitude of agencies involved in this grant application may have been an issue, as there is not a whole lot of precedence for multiple agencies/jurisdictions in the TIGER program. All past TIGER grants that did involve multiple agencies/jurisdictions were neighbors and shared a common interest, such as the Mississippi River Bridges ITS application in 2011 that involved Mississippi, Arkansas, and Lousiana, or the Memorial Bridge Replacement application in Portsmouth NH and Kittery ME from 2010. Finally, it is worth noting that the most successful TIGER grants have a lot of local and financial support, and it’s not very clear if this consortium of agencies had that. It’s assumed that all the involved agencies accepted the proposed costs of this plan, but some of them may not have had the money budgeted away for a local match. As noted in this post originally, this consortium formed rather rapidly before the June 3rd application deadline, so there wasn’t much time to drum up major support for this project. INDIANAPOLIS (September 5, 2013) – This morning, the Federal Transit Administration (FTA) announced the award of $10M in Transportation Investment Generating Economic Recovery (TIGER) funds to IndyGo, the public transit agency for Indianapolis, Indiana. The highly competitive grant program prioritizes transportation projects that have significant impact on outcomes relating to state of good repair, economic competitiveness, livability, environmental sustainability and safety of the nation’s transportation infrastructure. The award of these funds will allow IndyGo to recondition and repower upwards of 22 transit vehicles, employing a zero-emissions electric propulsion system. The 22 remanufactured electric propulsion transit buses will be completely rebuilt to like-new condition with a zero-emissions drive system and will cost approximately $555,000 each, comparable to a brand new diesel bus. In addition to the cost to rebuild and repower the vehicles, the grant also funds necessary charging stations at the IndyGo facility and the Transit Center, which is set to open in late 2015. The new electric buses will have a range of approximately 100 miles and will provide the equivalent of 16 MPG, quadruple the energy efficiency of a conventional diesel bus. The 22 new electric vehicles will be used on routes that are compatible with the range limitations and will allow IndyGo to retire some of its older buses. For project updates and other news, visit IndyGo.net. While not spelled out in the press release, it is clearly apparent that these will be ZEPS Electric Buses built by Complete Coach Works. For a refresher, this is same type of electric bus that Ben Franklin Transit is currently running and the same type that the consortium of agencies was going to use. 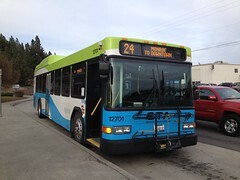 While I am disappointed that we won’t be seeing more ZEPS Buses in the Tri-Cities (or at least not yet), it is quite exciting to see other agencies taking the plunge and investing in this type of electric bus. This is a big deal for Complete Coach Works, as this will be the first multi-bus order of the ZEPS Bus. As previously mentioned before, there are only two ZEPS Buses in existence currently, one operating as a demonstration unit and sometimes part of the Gardena Municipal Bus Lines fleet while the bus at BFT is the first official production unit. The demonstration unit made an appearance at the APTA Conference earlier this year in Indianapolis, which likely sold officials at IndyGo on the technology. Based on the positive reception that the ZEPS Bus has received here in the Tri-Cities, I think it’ll do quite well in Indianapolis.